Day 2 – Making the low go. Tell us about your favorite way to treat a low. Juice? Glucose tabs? Secret candy stash? What’s your favorite thing to indulge in when you are low? What do you find brings your blood sugar up fast without spiking it too high? The best thing I've found to treat my lows is this . . .
A Mott's for Tots Strawberry Banana juice box. It has 13 grams of carbohydrate - pre-measured to make treating easy! It is 47% juice mixed with purified water and some added vitamin C, so it's quite healthy. It tastes really good. And with happy little strawberries and bananas smiling at me, how can I help but feel better?? But my favorite thing I've found to treat my lows is this . . .
Chocolate frosting!!! It's almost impossible to measure out. It almost always causes me to over-treat. There is absolutely nothing healthy about it. But my oh my, it tastes GOOD!!! And when I'm very very low and I need something to spike me up fast, I'll allow myself to indulge in a small spoonful. OH YUMMMMY!!! LOVE Chocolate frosting...I would totally "over treat if I had D"! Is there anything healthy about most ways to treat lows? We often use crackers just to make me feel better about the carbs I'm putting into Caleb. Chocolate frosting is an interesting idea. I'm always looking for ways to mix it up for Caleb so he doesn't get tired of the same old sugar tablet, but as he said, he really doesn't care, so I guess it's just one more thing I worry about that I probably don't have to! We love Mots Tots too, problem is it is hard to find them where I live. I had never though of chocolate frosting! Yummy! Chocolate Frosting - Oh yea! Chocolate frosting from the freezer is really good too! Sidenote....I love the title of your blog. Having diabetes is a tough life, but you're right, it's not all bad. Case in point--chocolate frosting! 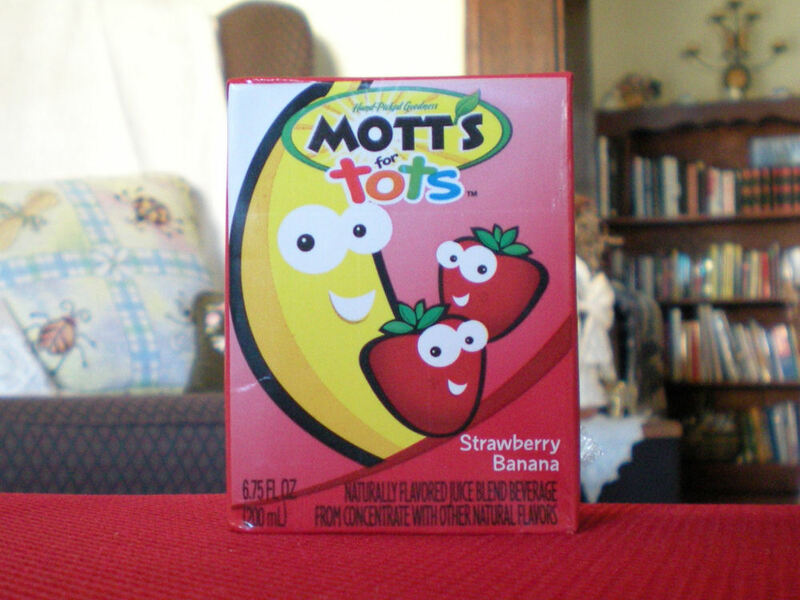 The box for the Motts for Tots is SO CHEERFUL!! I meant to say yesterday, thanks for the handy links on the sidebar with all the posts each day. Super convenient! I love this week's themes...so fun to read all the responses. THANK YOU for setting up! I am participating, but not showing up. Wow that chocolate frosting is looking pretty good right now!! I'm worried that if I try chocolate frosting, I will end up waking up in the middle of the night and eating the whole jar...when I'm not even low. I've read elsewhere about people using cake gel in tubes that were right around 15carbs, but the ones I looked at at the store were really really high in carbs... haven't figured that one out just yet. 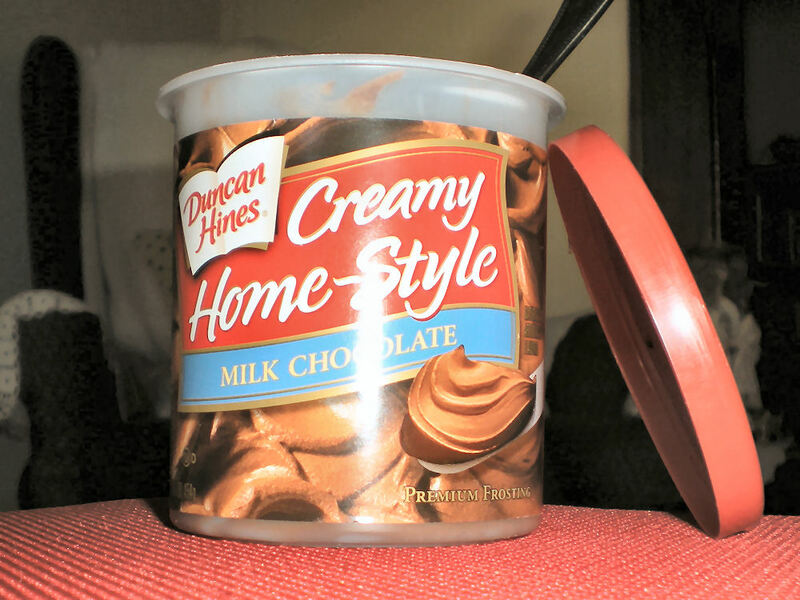 Never thought of icing from a tube - maybe not a good thing for me - as I'm addicted to chocolate if I have it in the house (as bad as having a can of whipped cream - pant pant - have some upstairs due to buying strawberries). Well, how I handle my lows is here at my latest entry for your project this week - check it out - maybe some of you are the same way as I am? I am so weird about juice. I never use it for lows since it freaks me out. I cannot tell you the last time I had juice. I think I am scared I will sky rocket. Juice I was told I could never drink again after I was diagnosed and even though I know better, It still gets to me. Another post that makes me crave something. Thank goodness there is no chocolate frosting in the house! Personally, I can't do juice, but cake frosting can be a tasty treat if only it were easier to measure. As someone else commented, I have heard that some people buy frosting in tubes which are premeasured. That probably works in cases where you can't crunch away on tablets. I am totally adding milk chocolate frosting to my "LOW" grocery list! mmm DELISH. OMG that frosting looks SO GOOD!